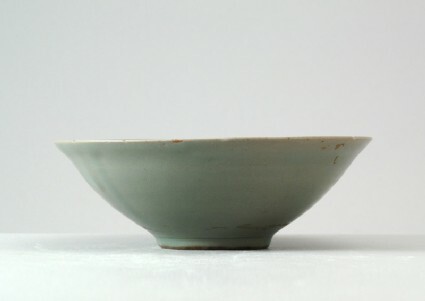 The wide conical bowl is slightly rounded and has a somewhat flared, six-lobed rim with tiny cut-outs. The tapering foot is ground down. The flat centre shows a faint impression, probably of a flower-head, and the inner sides are moulded with a broad band of a mallow pattern with five open blooms among elaborate long serrated leaves, with a broad band at the rim and the outside left plain. The somewhat opaque blue-green glaze probably covered the whole piece, including the foot and base, which shows three spurmarks, but the grey body is now exposed at the footring.